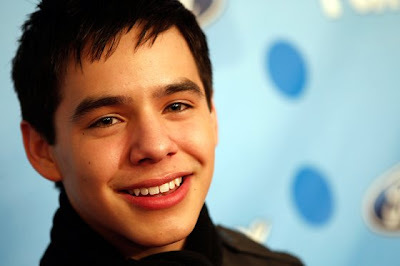 Some of you might know by now that I am a huge fan of David Archuleta. That is why I will support David Archuleta by pre-ordering his debut album at iTunes! I'm not usually the type of person who buys albums or songs (because you can just download them for free! *evil grin*) but because I am a fan and I want to hear more of little Archie's songs in the future so I bought his album which will release this November 11! I can't wait to download his songs on iTunes! Anyway I have been using iTunes to download songs because I find it more convenient than going to the music store to buy albums. On iTunes I can preview the song and check it's rating and popularity before I buy a song. I love how I can pick the songs I like rather than buying the whole album. I really hate it when I have a credit card. It doesn't compliment my being a compulsive buyer. There was this time when I was in a store with my credit card and then I had the urge to buy a Wii gaming console. Good thing I thought it out and I was able to prioritize my needs and instead of spending money I was able to save money. Anyway, I am sure that pre-orderinbg David Archuleta's album is money well spent!